I’m 36 weeks and 4 days right now. About 3 days ago I started having Braxton Hicks contractions a lot! I’m still having them regularly and I went to the doctor yesterday. They said I am dilated about 1 cm and my cervix is softening!! I also got the strep B test, so not a big deal! Anyways, now I’ve started having a cramping feeling on and off. So we’ll see what happens in the next week or so! I am pretty safe now to have her and the midwife said I could exercise again but no weights. So ball bouncing, walking outside, possibly elliptical here I come! 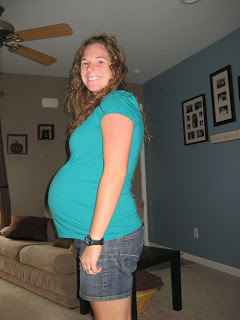 Here is a pic of me just over 36 weeks….oh boy am I big! girl…you are adorable! praying for you as you near the end!!! So cute! You are all belly!! Good luck with the rest of your pregnancy! Thanks for stopping by again! Doesn't that cake look so yummy! When they send it to me I knew I would have to try it! Oh… and thanks SO MUCH for adding my button to you blog! 🙂 AND sharing my bench! Love your wreath that you tried my Mandy's tutorial by the way! Thanks guys! I love both your blogs! No problem about your button Allison…it's so cute!